There is confusion in Dapchi, headquarters of Busari local government in Yobe state, over the return of Liya Sharibu, the only girl in captivity out of the 110 students abducted on February 19. While five of the students died, Boko Haram insurgents returned 104 to the town on Wednesday but the insurgents did not release Sharibu because she refused to renounce her Christian faith. The action of the group had sparked outrage, with many, including Muslim Rights Concern (MURIC), asking the federal government to negotiate her release. President Muhammadu Buhari had said his government would not abandon Sharibu. On Saturday, multiple sources told TheCable that the insurgents were on their way to Dapchi with the girl. “As of 3pm, we heard that they were 20 kilometres from Dapchi,” a resident who did not want his identity revealed, had said. A source had told TheCable that there was tension in Dapchi as many residents fled out of fear. confirmed that the girl was on her way back to the town. Idris spoke when he visited Rogers Nicholas, theatre commander of operation Lafiya Dole, in Maiduguri, Borno state capital. He said he had earlier planned to visit Dapchi as part of his on the spot assessment of deployment of personnel to schools in the north-east but cut off the visit to soften the ground on hearing that the schoolgirl was on her way back to Dapchi. However, more than 18 hours after, Sharibu has not made it back to Dapchi. “We hope these people are not up to something else. 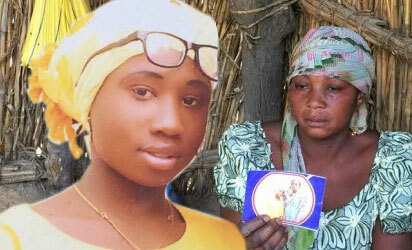 It did not take this long before they returned with the other girls,” Muniru Dapchi, a resident told TheCable on Sunday. Another resident said people are confused and do not know what to believe anymore. “We first heard that they were on their way. Later we were told that the military had gone to rescue her,” another resident said. A source told TheCable that the insurgents took the girl to a neighbouring village from where the military is expected to bring her back to the town she was kidnapped from. This newspaper could not independently verify this claim. Many residents fled the town on Saturday after they heard that Boko Haram was returning with Sharibu. The military reportedly went round to calm the people, assuring them of their safety. Attempts to reach Jude Chukwu, spokesman of the army, for the latest on the Dapchi situation did not yield the desired result as he neither answered calls nor responded to a text message sent.